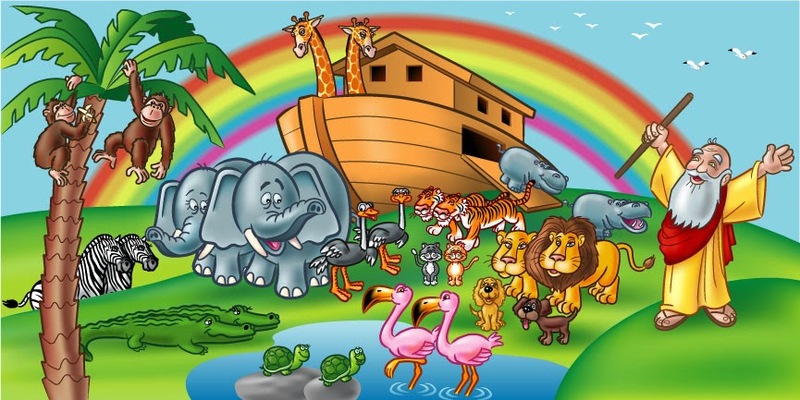 One of my favorite stories in the Bible is Noah’s Ark. We can learn a lot from Noah's Ark. 1. Don't miss the boat. 2. Remember that we are all in the same boat. 3. Plan ahead. It wasn't raining when Noah built the Ark. 4. Stay fit. When you're 60 years old, someone may ask you to do something really big. 5. Don't listen to critics; just get on with the job that needs to be done. 7. For safety's sake, travel in pairs. 8. Speed isn't always an advantage. The snails were on board with the cheetahs. 9. When you're stressed, float awhile. 11. No matter the storm, when you are with God, there's always a rainbow waiting. Here is a little story about two brothers and their sister that learned a lesson about Noah’s ark that is a great lesson for each of us. "Can you help me line up my Noah's Ark animals, Ben?" asked Ben's little brother Ethan. He looked at their sister. "You can help, too, Katie." "Okay," agreed Ben, sitting down at the table. "Anthony is such a pain," he continued as he placed the toy elephants side by side. "He's always talking about his soccer team. Who cares?" Katie picked up the pigs. "He's that new kid in your Sunday school class, isn't he?" she asked. "He couldn't be worse than Mia. She thinks she's so great just because she gets good grades in everything! She won the spelling bee last week." Katie set the pigs down. "And now she won first prize for learning the most memory verses in Bible club." Ben grinned. "Hey! You better not leave your pigs next to Mrs. Noah," he said. "I'm sure she won't like the smell!" Katie giggled. "I wouldn't have liked to be Mrs. Noah--living in a boat full of smelly, noisy animals! They probably fought all the time, too." "I like animals," said Ethan. "They didn't fight, did they, Mommy?" Mom smiled. "I like to think they didn't," she said, "or Noah's family, either. I should think they'd be so thankful to be safe on the ark that they'd gladly put up with bad smells and loud noises." Ben nodded. "Yeah. What's a bad smell--even a pig smell--compared to being drowned?" "But I guess you two would have grumbled and complained even inside the ark!" added Mom. "Mom!" cried Katie indignantly. "Why would you say that?" "Well, I've been listening to you grumble about your classmates," said Mom. "Anthony and Mia's habits and manners may be pretty annoying, but don't we all do annoying things at times? We're blessed to have lots of brothers and sisters in Christ--everyone who knows Him is one of His children. Instead of grumbling, we should be thankful to be part of God's family, and thankful that He provides a safe place from the storms of life. We should accept one another as He accepts us. What about each of us? Do other people sometimes annoy you? God's family is like Noah's Ark. It contains all of God's children, even those we don't always get along with. But God wants you to accept other Christians and live in harmony with them. He's willing to help if you ask Him. Dear Lord, help us to live in harmony with those around us. When we find our self weak help us to call upon Your Name for the strength to get along. In the Name of Jesus, Amen. Focus on the sweet new life. Do our best with what we have. The man who took the son gets everything. JESUS REALLY DOES LOVE YOU! What do you do with such a gift?